I’ve been thinking recently again about the very powerful words Dietrich Bonhoeffer wrote in his “Life Together.” Community is so hard to do well and appropriately. Unfortunately many times we pull back from others because of hurt or anger. These quotes from DB’s book have much to say to us what true Community is like. 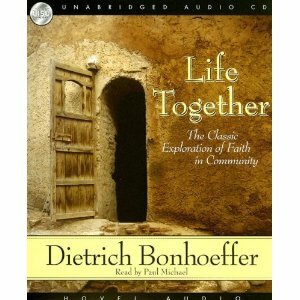 A book that everyone quotes is Bonhoeffer’s Life Together. He has a very convicting manner of telling us how to live in true biblical community. Yikes! If we are looking for the perfect group we’re missing what Christ has put in place. Our group or church probably is not the ideal community. But when we are searching for something more we are missing what Christ has ordained. So many folks are looking for as Bonhoeffer says, “some extraordinary experience.” They are frustrated because no group is good enough. That’s not good. What group/person can live up to perfection? They hop from group to group, church to church. This desire for perfection from others hurts in other ways too. When a group doesn’t make the grade we may not drop out. Sometimes we just pull back a bit relationally. We hold back getting involved. We keep our distance and don’t give ourselves to others. We stop loving wholeheartedly. Neither of these two (hopping or withholding) are right. In fact, Bonhoeffer says we are poisoning the community that is there. We hurt Christ’s church. We put ourselves outside of what the Lord is doing. We actually ruin what God is establishing. Tough words for our consumer oriented culture.